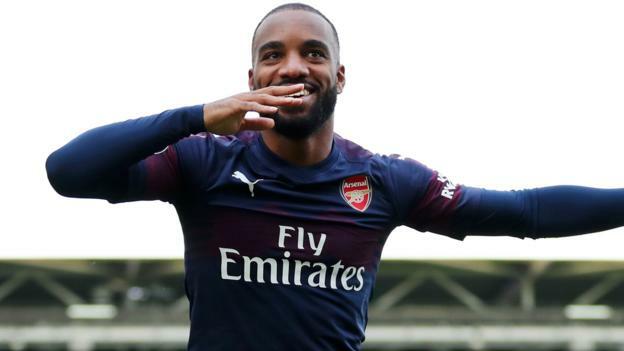 Alexandre Lacazette scored two impressive goals before substitute Ramsey finished off a classic team move and Pierre-Emerick Aubameyang netted twice. Ramsey was introduced in the 67th minute – and the Welshman added a third just 39 seconds later as Arsenal moved from left to right with one-touch passing and neat headers. Aubameyang added a fourth as he swivelled on a low cross from Hector Bellerin before side-footing the ball into the far corner. After losing their opening two Premier League games to Manchester City and Chelsea, Arsenal are showing real signs of progress under Emery. And the feel good factor seems to have returned to the club, with chants of “we’ve got our Arsenal back” ringing out from the away end at Craven Cottage. The first half was an even affair but the Gunners showed a clinical edge in the second period to blow their opposition away. Lacazette and Aubameyang appear to have a great relationship on and off the pitch, and they both scored from the two shots they had on goal on Sunday. Ramsey and Aubameyang became the first two substitutes to register a goal and an assist in the same game in Premier League history. Question marks still remain over Arsenal’s ability to achieve results against the division’s top sides – but Emery is building a team that are making a habit of winning. Before Sunday’s game, Fulham striker Aleksander Mitrovic said his side “needed to be smarter at the back” but would continue to play the same way and try to score goals. Fulham are the only Premier League side not to have kept a clean sheet this season, and the Cottagers have also conceded 21 goals – the most in the division. But that does not seem to have deterred Slavisa Jokanovic’s men from playing attacking football, as the hosts produced 12 shots on goal in the first half, albeit five of those were blocked and four were off target. The game could have been different as early as three minutes in when Luciano Vietto capitalised on a misplaced pass from Bellerin, but his fierce effort was well saved by Leno, via a Rob Holding deflection. But as the match developed, the visitors’ quality began to tell and Fulham’s attempt to go toe-to-toe with the Gunners was ruthlessly exploited. Defeat by the likes of Arsenal will not determine the Cottagers’ season, but Jokanovic may have to tweak his approach against top-quality opposition.